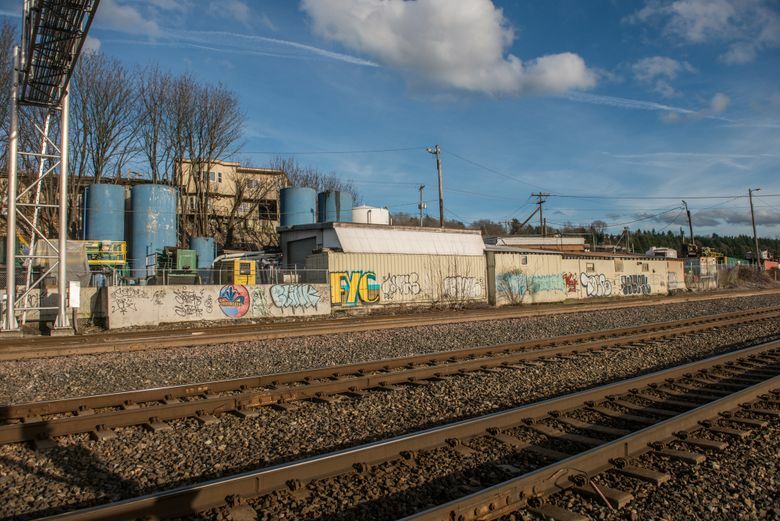 The Oregon-Washington Railroad built a depot in Georgetown in 1910, but soon most train traffic was stopping at Union Pacific’s station at Fifth Avenue and Jackson Street. 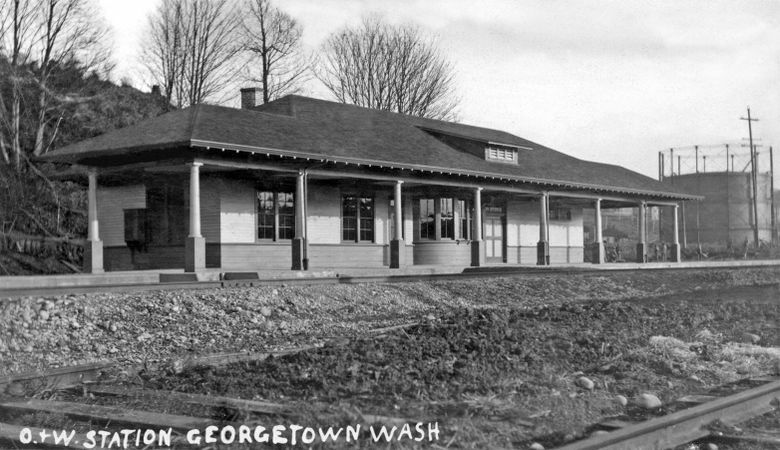 THIS PORTRAIT OF Georgetown’s sharp but short-lived Oregon-Washington Railroad Station is the third “then” we have pulled from an album shot and/or gathered by Henry J. Fickeisen. Henry was the son of Carl W. Fickeisen, an early Georgetown baker who started sweetening the Duwamish Valley with his cream cakes in the 1890s. Our first Fickeisen choice was a portrait of the Georgetown Volunteer Fire Brigade pausing and posing in uniform during a parade on Seattle’s Pike Street. Next, we featured a story aboutRainier Beer’s Venus fountain. It was shown not flowing but frozen. The depot photograph’s postcard qualities might make one wonder whether Henry Fickeisen purchased it from a professional. But his album has many examples of personal snapshots of family subjects and landmarks sensitively composed. Finding little else on the tidy depot, aside from the Times notice, I turned to Kurt Armbruster, Seattle’s encyclopedic rails historian. He, in turn, reached rail archivist Dan Cozine, who told us that the Oregon-Washington Railroad & Navigation Co., regional subsidiary of the Union Pacific, built the depot in 1910. The building’s large waiting room, baggage room and 300-foot platform indicated it was intended as a suburban passenger station to serve the growing South Seattle area. These grand intentions, however, were not to be. Most Georgetown-bound passengers arrived by street trolley and not on a mainline train. After the 1911 opening of the Union Pacific’s grand station at Fifth Avenue and Jackson Street, few trains stopped at Georgetown. The frequent exceptions were those loading cases of Rainier Beer by the hundreds at the Seattle Brewing and Malting Company’s big brewery about 200 feet to the north of the depot. In 1910, Georgetown was preoccupied with being encircled by Seattle. On March 20, The Times predicted “Georgetown Will Come In.” The newspaper’s list of advantages that would come with annexation into Seattle included Cedar River water, “high school privileges,” a much better police force “for the same price,” a move from “practically no street improvements” to “all she needs,” respected contracts and protected rights, her own councilmen (for the 15th Ward) and something more than “a meager fire department” like the one the Fickeisens volunteered for. The Times made no mention of trains or trolleys. On March 29, the citizens of Georgetown decided on annexation and enhanced encirclement. They joined Seattle.